Today was the first day in ages where we woke up to blue skies (sort of) and, more importantly, no snow or ice on the ground. Not that there has been any proper snow yet, just that mushy stuff that instantly goes grey when it hits tarmac. So I donned bobble hat and ski jacket and set off to give the blackcurrants and raspberries a good chop. They need it. The raspberry patches, both of them, resemble jungle warfare. 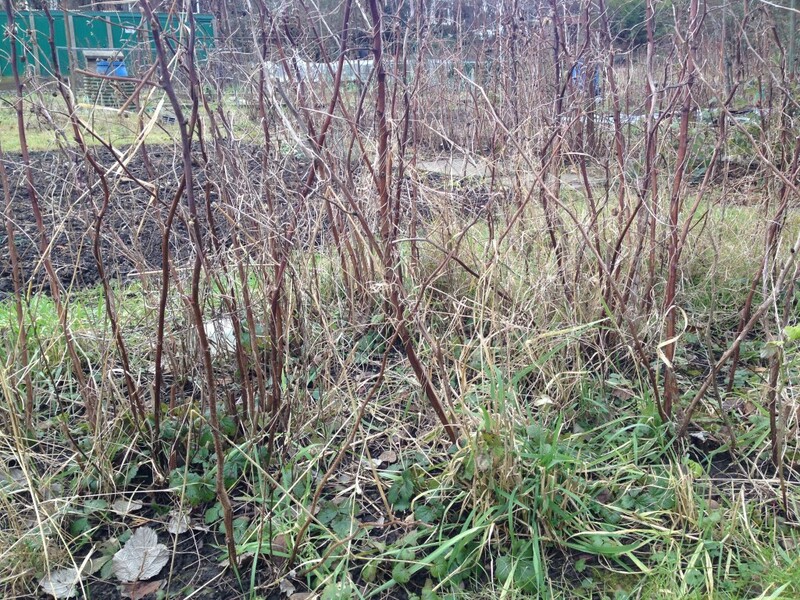 The problem isn’t the fruit canes, but the grass, briers and bind weed that have manipulated themselves around each stem, made themselves at home and still refuse to leave, like a visitor that has long outstayed their welcome at a party. The blackcurrants, by contrast, are well behaved but so long established that they require a saw rather than secateurs. I don’t have a saw (I don’t have much of any garden equipment really) but gave it a go nevertheless. Apparently you have to take out a third of the old wood, and you tell the old wood as it is dark in colour. I wasn’t brave enough to take out a third, just a few branches here and there. Even in dormancy the wood smelt fragrant and for an instant I was transported back to the summer, macerating blackcurrant leaves in hot syrup to be turned into sorbet. 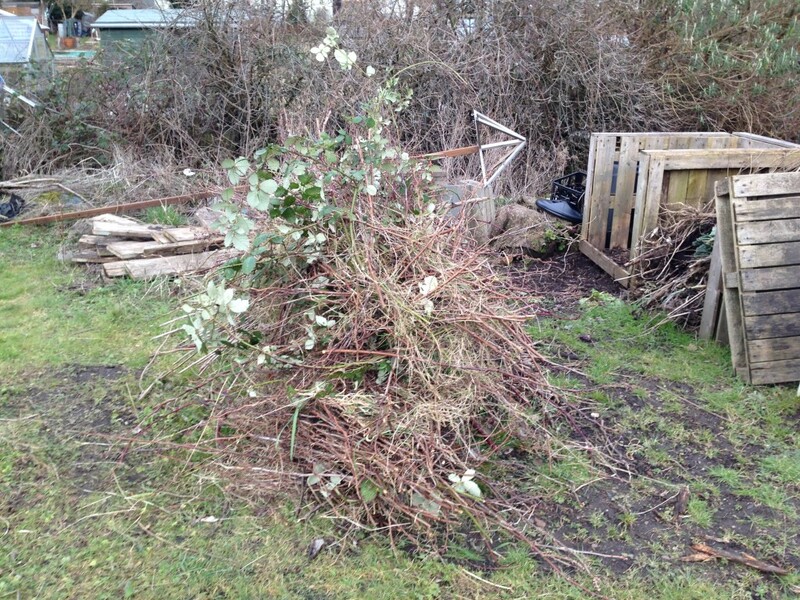 It took about two hours to chop the lot down and I only poked myself in the eye with a cane once (result!). 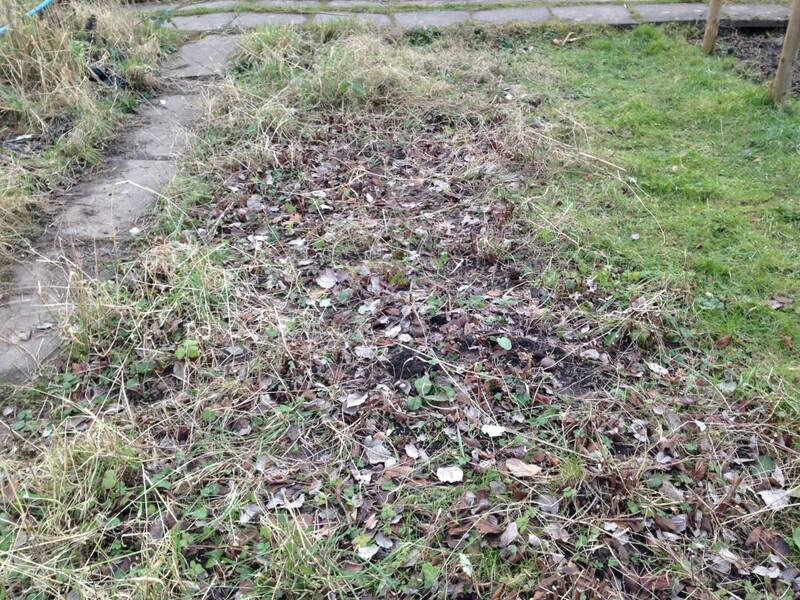 It all now needs a proper weed and, in truth, some of the raspberry plants digging up. That can wait for another day. Meanwhile the shed is not bearing up to winter. 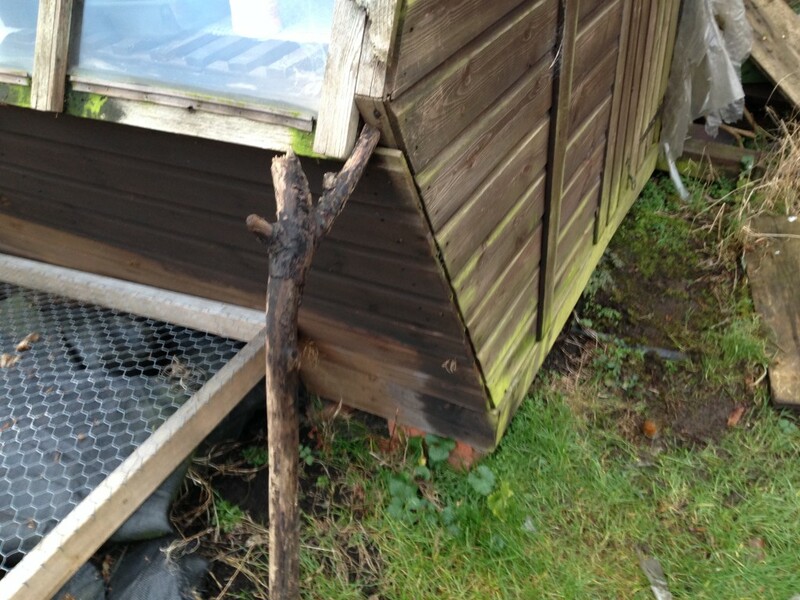 It was rickety anyway, but now the felt is hanging off the roof and getting the door shut is only possible if you give the whole structure a massive shove whilst simultaneously shutting the bolt. My arms aren’t long enough for this so I’ve taken to improvising using cast-off branches from the adjacent tree. 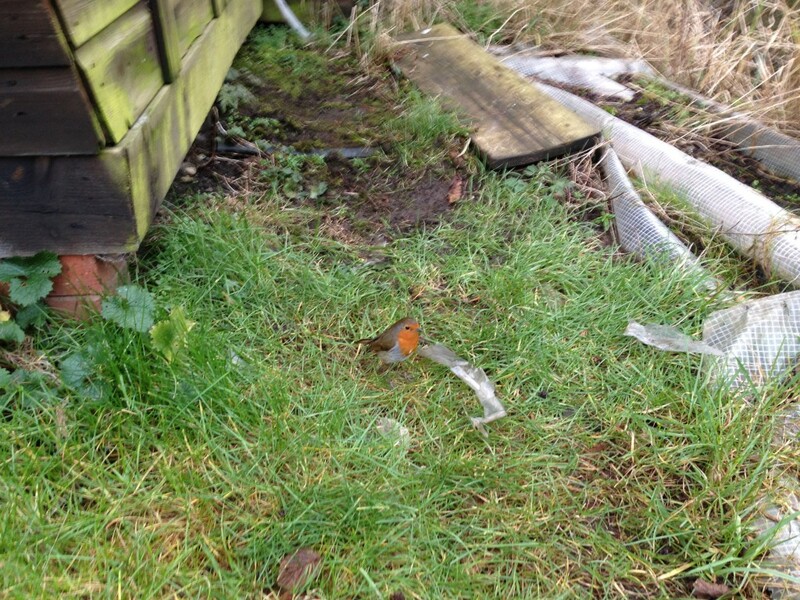 The robin seems to think this hilarious and comes to laugh at the action. As a reward, roast venison followed by cherry pie for dinner. I would not have imagined a few years ago that my winter weekends would now be thus. 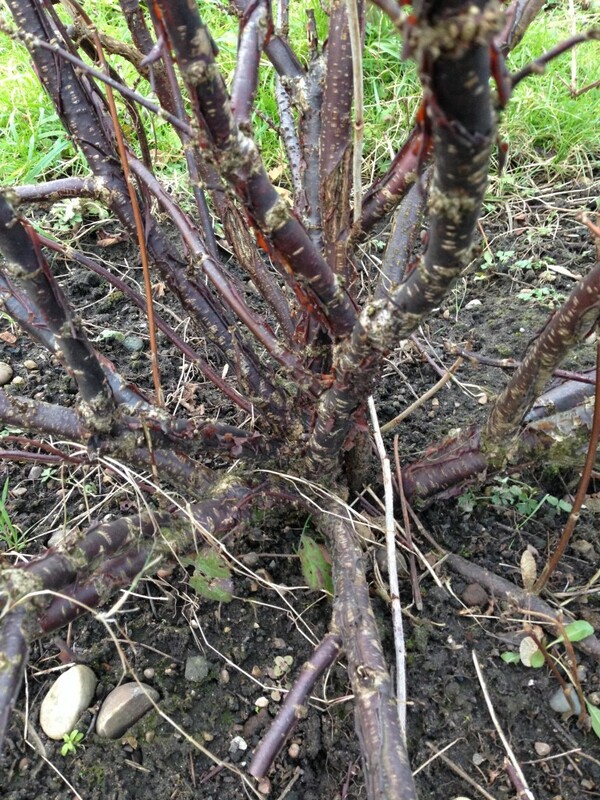 This entry was posted in Allotment, Winter and tagged blackcurrant pruning, raspberry pruning. Bookmark the permalink.